Farmville municipal offices are located at 116 North Main Street, Farmville, VA 23901; phone: 434-392-5686. Photo: Longwood House, Johnston Street, Farmville, VA. Listed on the National Register of Historic Places in 1984. Photographed by user:Christopher Hobeck - Victor M (own work), 2014, [cc-by-3.0 (creativecommons.org/licenses/by/3.0)], via Wikimedia Commons, accessed April, 2018. The Town of Farmville [†] is approximately 47 miles from the City of Lynchburg, 64 miles from the City of Richmond and 76 miles from the City of Charlottesville. The Town is located in the Piedmont area of South-Central Virginia. It spans the northern portion of Prince Edward County and the most southern portion of Cumberland County. Over 200 years ago, a ford was the only crossing between the Appomattox River and Prince Edward and Cumberland Counties. In February 1762, a bridge was completed at what was then called Rutledge's Crossing; the settlement, which grew up around the bridge, was founded as the Town of Farmville in 1798. The navigation of the Appomattox River and the coming of the railroad contributed to the early expansion of Farmville. The expansion of Longwood University, which was founded in 1839, also added to the growth of Farmville. In 1872, Farmville became the county seat for Prince Edward County when the courthouse was moved to Farmville from Worsham. The Civil War, during its final stages, was very close to Farmville. The last major battle of the war was on April 6, 1865, at Sailor's Creek, located on the Prince Edward/ Amelia County lines. 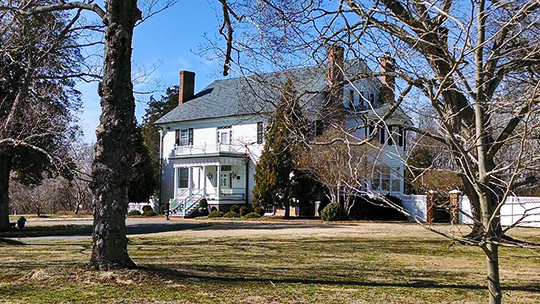 General Joseph E. Johnston, a noted Confederate, was born at Longwood House in Farmville, which currently serves as the home for the President of Longwood University. Although the Town was formed in 1798, it was not incorporated until 1912. It was then that Farmville, which was the agricultural heritage of the local economy, soon become balanced by industrial and retail growth. This growth has established Farmville as the center of trade for the south-central region of Virginia. † Town of Farmville, Comprehensive Plan 2017-2022, 2017, www.farmvilleva.com, accessed June, 2018.